Today is Wednesday, so I am sharing what is on my work desk with you! My favorite fountain pen shop wanted to see our pink supplies. Since October is breast cancer awareness month, I thought it was a great idea. As many of you know, I just adore pink (heck, my stamp room is pink!). As I was pulling stuff out, I realized how the shades of pink make me happy! My pencil sharpener is a new acquisition, and I adore it. Thank you, Julia, for the desk hopping fun! I am looking forward to seeing what you are all working on. Have a fabulous day! Until next time! That is a lot of pink! I always say I don't really care for it but then I look around and I see such a lot of it, I've even got a pink fleece jacket! I only learnt to knot socks a couple of years ago, I bought a basic book, watched some videos on the net and I was away, give it a go, you might be surprised! Thanks for sharing your pink desk and visiting mine. I'm not a 'pink' person either. Never have been even as a child. But I had breast cancer 3 years ago so I totally love the idea of Breast Cancer Month. Well done. My youngest granddaughter's favourite colour is pink, so we tend to buy/make lots of pink things. The pencil sharpener is cool. I love the quill and inkwell! Yay!! Pink really makes you happy (and me). And I just came from my quarterly cancer check (breast cancer), so I appreciate that awareness also. 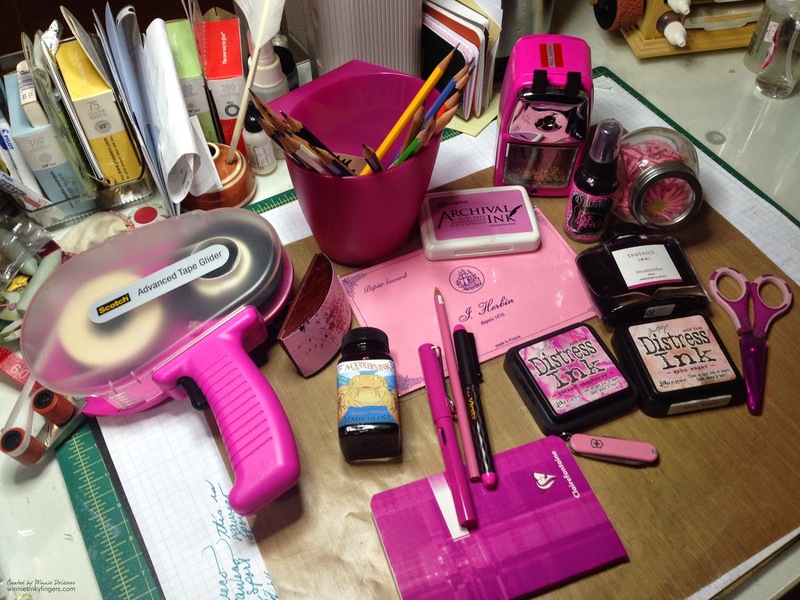 Love all the pink in your studio Winnie, I have the same big pink tape dispenser.